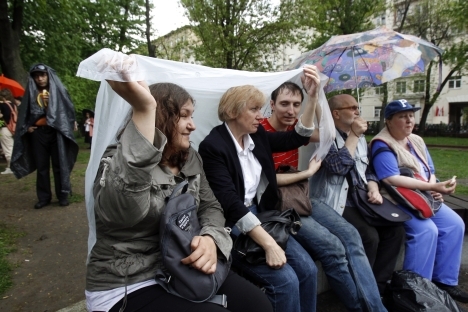 The worldwide “Occupy” movement has finally arrived in Moscow. As President Vladimir Putin settles into office, anti-Kremlin demonstrators are implementing new tactics to test the limits of their protests and the authorities’ tolerance. So far, they’ve succeeded – a central Moscow park has turned into a makeshift campsite and the new home base for the opposition movement. But how long will it last? Putin’s inauguration on May 7 was preceded by an outbreak of violent and unprecedented protest action. Unlike the peaceful rallies of the winter, in which tens of thousands gathered to denounce the regime, the breakout of more aggressive protests on the eve of his lavish inauguration ceremony marked the beginning of a new, potentially darker chapter in the opposition movement. Yet in the following days, the anti-Kremlin demonstrators changed course and have since then attempted to implement a plan perhaps more familiar in Belarus, where stringent anti-demonstration laws have forced activists to resort to more clever tactics, such as setting off cell phone alarms or simply gathering in silence. And neither the earlier violent confrontations nor the seemingly senseless arrests of key leaders seemed to deter demonstrators from trying such new tactics. Now, the Moscow demonstrators have turned to the “Occupy Wall Street” movement for inspiration. They have opted to gather without slogans, placards and anger – and with only their white ribbons and sleeping bags. Calling their event “Occupy Abai,” they have turned a statue of 19th century Kazakh poet Abai Kunanbayev, nestled inside the Chistye Prudy park, into their fortress. Each day, a handful of activists camp out overnight, while in the afternoons and evenings the park swells with participants and curious onlookers. There, volunteers give lectures on politics and history, ordinary demonstrators debate the future of the opposition, and a makeshift information center – staffed by a handful of university students – helps coordinate it all. Even given the relative inaction, it’s clear from the sea of white ribbons and the human collage of bespectacled intelligentsia why the crowds have gathered. This, perhaps, has been the most striking feature of the latest form of demonstration. In stark contrast to the violent events of May 6, the authorities have allowed members of the Abai crowd to largely do as they please: organize song circles, stage public debates, and even make their beds along the muddied grass that abuts the statue. The closest the event came to confrontation was on Monday, when a group of riot police and regular officers were dispatched to the area to urge the demonstrators to move their camp. After an intervention by opposition activist Ilya Yashin, the occupiers and police reached an unusually civil compromise to move their post further along the park. Yashin later told reporters that activists had established a “dialogue” with police and that as a show of good faith, they would cooperate with the authorities in setting up a new zone. So has the protest movement found a new outlet? It’s still unclear. A new mass rally is reportedly planned for June 12, the otherwise little-acknowledged Russia Day, and last weekend saw an estimated 10,000 people, led by a handful of opposition-minded writers and artists, attend a largely undisturbed “stroll” through central Moscow. As for the Abai occupiers, they seem determined to hold strong for as long as it takes, and when reminded by how the flagship “Occupy Wall Street” movement was finally dispersed by the police, many remained unfazed – hardened, even – to the prospect of future confrontation. Because while Moscow Mayor Sergei Sobyanin has denied City Hall plans to break up the sit-in, Putin spokesman Dmitry Peskov’s now-famous quote that “protesters should have their livers smeared on the asphalt” for confronting the police nevertheless keeps many on their toes.